In a series of representative case studies, Marianne Van Remoortel traces the development of the sonnet during intense moments of change and stability, continuity and conflict, from the early Romantic period to the end of the nineteenth century. Paying particular attention to the role of the popular press, which served as a venue of innovation and as a site of recruitment for aspiring authors, Van Remoortel redefines the scope of the genre, including the ways in which its development is intricately related to issues of gender. Among her subjects are the Della Cruscans and their primary critic William Gifford, the young Samuel Taylor Coleridge and his circle, Elizabeth Barrett Browning's Sonnets from the Portuguese, George Meredith's Modern Love, Dante Gabriel Rossetti's House of Life and Augusta Webster's Mother and Daughter. As women became a force to be reckoned with among the reading public and the writing community, the term 'sonnet' often operated as a satirical label that was not restricted to poetry adhering to the strict formalities of the genre. 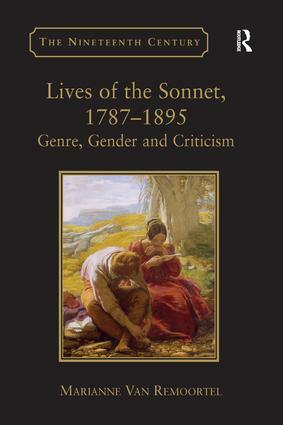 Van Remoortel's study, in its attentiveness to the sonnet's feminization during the late eighteenth century, offers important insights into the ways in which changing attitudes about gender and genre shaped critics' interpretations of the reception histories of nineteenth-century sonnet sequences. Marianne Van Remoortel is a postdoctoral researcher at Ghent University, Belgium.